Now a team of Stanford researchers has looked at the "energetic cost" of manufacturing batteries and other storage technologies for the electrical grid. At issue is whether renewable energy supplies, such as wind power and solar photovoltaics, produce enough energy to fuel both their own growth and the growth of the necessary energy storage industry. "Whenever you build a new technology, you have to invest a large amount of energy up front," said Michael Dale, a research associate at Stanford. "Studies show that wind turbines and solar photovoltaic installations now produce more energy than they consume. The question is, how much additional grid-scale storage can the wind and solar industries afford and still remain net energy providers to the electrical grid?" Writing in the March 19 online edition of the journal Energy & Environmental Science, Dale and his Stanford colleagues found that, from an energetic perspective, the wind industry can easily afford lots of storage, enough to provide more than three days of uninterrupted power. However, the study also revealed that the solar industry can afford only about 24 hours of energy storage. That's because it takes more energy to manufacture solar panels than wind turbines. "We looked at the additional burden that would be placed on the solar and wind industries by concurrently building out batteries and other storage technologies," said Dale, the lead author of the study. "Our analysis shows that today's wind industry, even with a large amount of grid-scale storage, is energetically sustainable. We found that the solar industry can also achieve sustainable storage capacity by reducing the amount of energy that goes into making solar photovoltaics." Wind and solar farms provide emissions-free energy, but only generate electricity when the wind blows or the sun shines. Surplus energy can be stored for later use, but today's electrical grid has little storage capacity, so other measures are used to balance electricity supply and demand. "Wind technologies generate far more energy than they consume," Dale said. "Our study showed that wind actually produces enough surplus electricity to support up to 72 hours of either battery or geologic storage. This suggests that the industry could deploy enough storage to cope with three-day lulls in wind, common to many weather systems, and still provide net electricity to society." The results were especially good for onshore wind turbines. 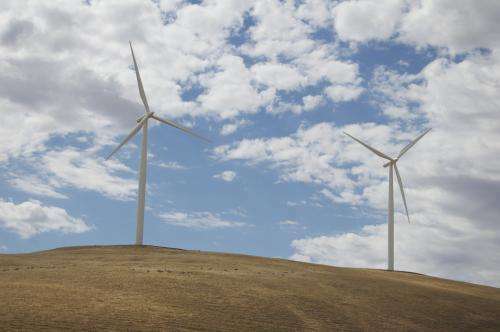 "We found that onshore wind backed by three days of geologic storage can support annual growth rates of 100 percent – in other words, double in size each year – and still maintain an energy surplus," he said. "These results are very encouraging," said study co-author Sally Benson, a professor of energy resources engineering and director of the Global Climate and Energy Project (GCEP) at Stanford. "They show that you could create a sustainable energy system that grows and maintains itself by combining wind and storage together. This depends on the growth rate of the industry, because the faster you grow, the more energy you need to build new turbines and batteries." For the solar industry, the Stanford team found that more work is needed to make grid-scale storage energetically sustainable. The study revealed that some solar technologies, such as single-crystal silicon cells, are growing so fast that they are net energy sinks – that is, they consume more power than they give back to the electrical grid. From an energetic standpoint, these industries "cannot support any level of storage," the study concluded. "Our analysis showed that, from an energetic perspective, most photovoltaic technologies can only afford up to 24 hours of storage with an equal mix of battery and pumped hydropower," Dale said. "This suggests that solar photovoltaic systems could be deployed with enough storage to supply electricity at night, and the industry could still operate at a net energy surplus." One advantage of wind over solar power is that it has an enormous energy return on investment, Benson explained. "Within a few months, a wind turbine generates enough electricity to pay back all of the energy it took to build it," she said. "But some photovoltaics have an energy payback time of almost two years. To sustainably support grid-scale storage will require continued reductions in the amount of fossil fuel used to manufacture photovoltaic cells." The Stanford team's primary focus was on the energetic cost of deploying storage on wind and solar farms. The researchers did not calculate how much energy would be required to build and replace grid-scale batteries every few years, nor did they consider the financial cost of building and installing large storage systems on the grid. "People often ask, is storage a good or bad solution for intermittent renewable energy?" Benson said. "That question turns out to be way too simplistic. It's neither good nor bad. Although grid-scale storage of wind power might not be cost effective compared to buying power from the grid, it is energetically affordable, even with the wind industry growing at a double-digit pace. "The solar industry needs to continue to reduce the amount of energy it needs to build photovoltaic modules before it can afford as much storage as wind can today." There is no infrastructure in place that would turn electricity into the required materials to make windmills and batteries, so it cannot be the windmills or solar panels that provide the energy. The energy invested in them comes from fossil fuels. In other words, it's about the same thing as corn ethanol, where every barrel of it requires 0.75 barrels of oil to produce. Your argument is not valid because, indeed, we use fossil energy to produce, renewable infrastructure but afterwards renewable energy replaces fossil energy in other things which would require fossil.The thing that matters is that we get a higher efficiency. Instead of transforming fossil directly to energy, we send it to another synthesis project that provides enough efficiency boost to make sense. On wiki they said that 16% are renewable in 2012 (but they put together also biomass and hydro) which means that every new renewable source is powered 16% by itself, percentage which will increase, and maybe by the time will have 50-70% green energy, then the required infrastructure will be ready. One thing that worries Wind Farm Investors is "Deaths of Birds"....In fact, they were forced to uproot some of their wind mills that were already erected. Why NOT make use of Blinding Mirrors directed upwards around the circumference of Wind Farms to Prevent Birds from getting in? They can be at heights so as not to bother humans on the ground....Those Blinding Mirrors can be lit even at night times! So much Research in this direction is now due so as to prevent any bad outcomes! Once it is perfected...it should beat other ways. Why NOT Solar Panels around the stems of Wind Mills? They can always be directed upwards, though! In fact, like in Multitude of Branches of Tree....They should fill up the spaces in between Any 2 Wind Mills with Horizantal branches of Steel Rods sporting SOLAR PANELS! In fact, Why Not set up Wind Farms inside LAKES filled with Biofuel-Maker Algae? Migrating Birds will not be hurt by the Blinding Mirrors because........They will only start feeling discomfort as they approach the Wind Farm area when they are still far away & hence keep moving towards the left & right of it when miles away itself! Owners can always REMOVE the Blinding Mirrors if they were found to be disruptive of Birds' Natural Behaviors in any hurtful ways. Your argument is not valid because, indeed, we use fossil energy to produce, renewable infrastructure but afterwards renewable energy replaces fossil energy in other things which would require fossil. Everyone says it will happen, but nobody has as of yet explained how it will happen, or how it is even possible. If it were by your logic then we would have never powered the 1st 1% of renewable energy, cause it was powered by 99% fossil. Renewable energy as it stands is 100% dependent on fossil fuels. No fossil fuels, no renewable energy. Dump trucks and diggers don't run on sunshine, and neither do steel mills and cement factories. Did you know for example, that steel requires coal to make because it is used to chemically bind the oxygen and turn it into a gas that can escape so it turns rust into pure iron. The smelters mix the iron ore with mountains of coal and then burn the lot. Powering them on charcoal would decimate entire forests. I think Robots purposefully located at the top of the Stems of Wind Turbines should indulge in some useful hitherto yet uncotemplated ways to aid in the enhancement of the functions of those Wind Turbines! Renewable energy needs copper, steel, aluminium, indium, neodym and concrete. Or you know, we could use new triboelectric systems in the wind generators instead of magnets that need all those valuable metals. Then again, one can argue on how durable the nanotextured triboelectric surfaces are. I don't think you could make a more vague statement. You literally just said we should add robots with no current purpose to make turbines better. That means absolutely nothing. it would have already been a reality, closing energy problem once and forever. "The researchers did not calculate how much energy would be required to build and replace grid-scale batteries every few years, nor did they consider the financial cost of building and installing large storage systems on the grid." It's only occasionally a surplus while energy is generated by other sources, and there's yet any sensible way of storing it. Silly article. It's all down to relative cost. Don't pretend otherwise. Your ineluctable bias against renewable (wind, solar, etc.) I don't understand. Did you know for example, that steel requires coal to make because it is used to chemically bind the oxygen and turn it into a gas that can escape so it turns rust into pure iron. Again disingenuous. That we have to use coal for some specific process does not validate its widespread use elsewhere. Would you, for instance, suggest that as we use morphine to ease terminal suffering, it's OK to give it to children to treat their headaches? Many of the commenters seem to be saying that once you have made a wind generator you have to keep pouring fossil fuel energy into it. Is this what you are really saying? Eventually much of the energy needed for maintenance/replacement of parts, etc will come from what has already been generated. It's all down to relative cost. The authors of the study intentionally disregarded costs. Well, since the subsidies for coal, oil and nuclear are still way higher than those for renewables, I think you're barking up the wrong three here. Though definitions vary, in 2013 the IMF found that when "post-tax" externalities like carbon emissions, effects on health and resource scarcity were considered, global subsidies of fossil fuels rose to "$1.9 trillion worldwide – the equivalent of 2.5 percent of global GDP, or 8 percent of government revenues." Estimates for renewable subsidies top out at a comparably measly 88 billion dollars globally. You might as well argue that we could make steel by smashing atoms in particle accelerators to avoid using coal in smelters - that too is just down to relative cost. There's no bias in pointing out when something does not have a practical alternative. Indeed it doesn't. Where did I claim otherwise? Again I'm merely pointing out the obvious. You can't make windmills without coal and oil before you come up with ways to make the materials using no fossil fuels. Renewable energy like wind and solar is 100% dependent on fossil fuels to exist at all. How about: subsidies per amount of energy produced. That's not an unreasonable metric. It's also the one that you keep systematically ignoring because there the renewable energies are orders of magnitude ahead of conventional energy production. There's not a country in the world that subsidizes eg. nuclear power by unit of production. Wind power on the other hand is only commercially viable because of the feed-in tariffs. Wind should only be used for electrolysis to make H2. It is the least reliable of any electrical producer. IT is a nightmare to manage on the grid due to its unpredictability. It will cause a major outage sooner or later. When you need it the most winds is not there. Pretending it is a savior is a g rave disservice. Daqddyo. Wind is so unreliable you have to back it up with fossil. You have to keep gas units running at minimum load which is very environmentally and fuel inefficient to guard against a wind drop which can happen in minutes. So the gains trumpeted are not near what they appear. Wind has its place, but it is far, far from the energy answer for America. How about trying to get to an energy sector where we don't have to pay subsidies? Renewables can get us there. Fossil fuels (and nuclear) can't do that - so they will never be cheaper than renewables in the long run. - ...oh...and that we'd live in a much cleaner environment. So what exactly are the advantages of the old energy types you're so religiously defending? They are not cheaper and they only cause ever increasing problems. Anyway we will never be free of fossil because they are needed also in other things than electricity. A lot of the gas/petroleum consume if not the majority doesn't go into electricity but goes directly towards the petrol based industries ( fertilizers, plastic materials, even food industry is quite hungry, etc). The only solution i can think of is zero carbon substitutes but which have to be comparable in cost with fossils. But we still have a long road ahead since our fossil deposites are still plenty, and the direct extraction costs are lower than alternatives.